E-commerce is everywhere. Think for a moment, how many people do you know who have never bought or sold anything online? You will probably be able to count them on fingers. According to a report by Business Insider, the U.S. consumers spent nearly $385 billion online in 2016 and expected to increase to $632 billion by 2020. This, however, will be accompanied by challenges. The competition will rise and attracting new customers will become difficult – a challenge troubling most businesses even today. Businesses will have to find ways to differentiate themselves from competition, attract customers and convert them. One such way would be to offer financing options to customers (a strategy applicable for most businesses but more relevant for high-ticket purchases). Imagine how difficult it would be for customers to let go of that product when they can BUY NOW and PAY LATER – a strategy utilized and perfected by brick-and-mortar retailers. As discussed above, e-commerce financing refers to the act of giving customers flexible payment options that they can use to buy a product now and pay for it over a period of time (say monthly installments). What are the benefits of e-commerce financing? When is the merchant paid? This depends on the financing solutions company and your agreement with them. But, typically the merchant gets paid upfront in full. Who owns the credit risk? The financing solutions company owns the payment/ credit risk. What is in it for the financer? The financing solutions company charge a small fee for their services. Step 1 – The merchant ties up with one of the financing solutions company and integrates (add their code) their payment solution with the e-commerce store. Step 2 – The customers visit the e-commerce store and select the product(s) they wish to purchase. Step 3 – The customers selects the option to buy now and pay later using the call to action button made available through the integration (in step 1). Step 4 – The customer completes the checkout process by sharing some mandatory information. Step 5 – The merchant gets paid depending on the agreement between the merchant and the financing company. The financing company collects the payment from the customer and charges a fee for their services. What options are available out there? Affirm: Affirm aims to reinvent the financing industry using technology. Their financing solutions are easy to use and flexible. Klarna: Klarna, one of the fastest growing companies in Europe, offers safe and easy-to-use payment solutions to e-commerce stores. Klarna is active in more than 18 markets and works with nearly 65,000 merchants serving 45 million consumers. AfterPay: AfterPay offers swift and manageable financing solutions to merchants across channels – e-commerce, mobile, and in-store. Available only in Australia, AfterPay is used by hundreds of merchants and the list is still growing. Pay4later: Now known as Deko, offers a unique multi-lender platform optimized to maximize sales. Pay4Later offers a great experience in-store, online, on mobile and even over the phone. Pay4later serves more than 1000 online retailers across the UK and is considered one of the safest and fastest e-commerce finance solution in the UK. Zibby: Zibby is a little different from other solutions that targets the non-prime and under-banked customers who intend to buy online. It is a simple financing option that requires less than 30 seconds to integrate with the product and check-out pages. What should I consider when evaluating a financing partner? The usability of the service – anything that complicates payment or requires customers to fill in too much information will drive them away. Look for a solution that seamlessly fits into your checkout process. Payment terms and Risk – spend some time to understand when you will get paid, the terms, and how the risk is distributed. The availability of APIs or integration with your e-commerce platform – look for solutions that can easily be integrated with your e-commerce platform. Branding and Customizations – check if the solution can be customized to meet your branding and business (loan terms, loan programs, etc.) requirements. Availability across channels – if you are operating across channels check if the same solution can be leveraged across channels. Payment terms for customers – what would happen if a customer is unable to make a payment? How much will he/she be charged? Work with the financing partner to get the best deal for your customers. Availability of customer service and support – pay extra attention to how the financing company will treat you and your customers. Remember, all positive and negative experiences with the financing company will also be associated with your brand. Remember, the customer experience is the key differentiator and financing companies have done their best to simplify financing as much as possible. Unlike a few years back, when customers were redirected to other websites, made to fill long forms, etc. financing today is available at the click of a button. 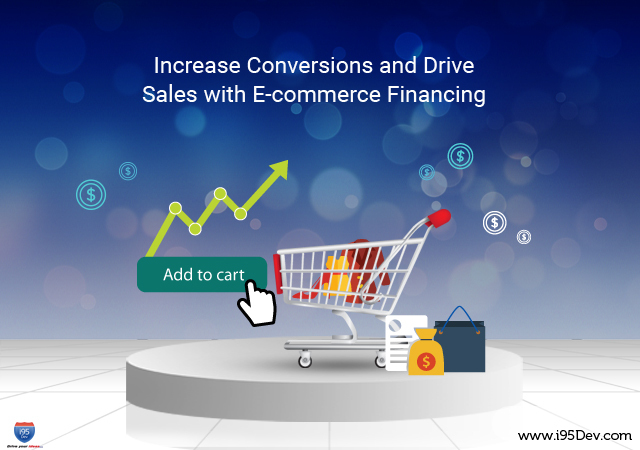 A number of online merchants have integrated e-commerce financing solutions with their e-commerce store and seen an uplift in their conversion rates, around 25%, and an increase in their average order value, nearly 80%. Which is remarkable!